Australian GDP: Sink or Swim? Much has already been said about Australia‘s Q1 2011 GDP… and it hasn’t even come out yet! As early as January, after severe flooding and Cyclone Yasi did a number on Australia, analysts (myself included!) were already churning out predictions for Q1 2011 GDP. Many said that the floods would drown exports and GDP. A fair enough assumption, I’d say. After all, the bulk of Australia’s exports come from mining, and it was the industry that was most affected by the floods. With the waters flooding out their mines, many Australian miners couldn’t heigh-ho heigh-ho themselves off to work to bring home the bacon! Economic nerds also predicted that consumer spending would take a hit in Q1 because of higher borrowing rates, which is no doubt the result of the series of rate hikes the RBA rolled out in 2010. Overall, I guess you could say that analysts had all but given up hope for the economy in Q1. No wonder the consensus forecast is for GDP to drop 0.3% in Q1 2011 after posting a 0.7% growth in Q4 2010. Not only were they expecting to see weak domestic demand, but they were also anticipating a big drop in exports. So much gloom and doom! How likely are these downbeat forecasts to come true? If you take a look at the actual data, you’ll realize that the Australian economy was actually more resilient than expected. Can you expect anything less from the only G7 nation that was able to dodge a recession a few years back? Sure, Australian exports took a hit in February, falling by a seasonally adjusted 2% during the month and put a glaring red stain on their trade balance. However, this setback merely set the stage for a major comeback the next month when exports rebounded by a whopping 9% in March. This was more than enough to bring their trade balance back in the green as Australia boasted of a 1.74 billion AUD surplus. Aside from that, Australia’s consumer sector also managed to keep from going down under. Although retail sales ticked lower in March, consumer spending for both January and February came in stronger than expected. January’s 0.5% increase and February’s 0.4% uptick could compensate for the 0.5% drop in March and contribute positively to the first quarter GDP. And let’s not forget the impressive gain in Australian capital expenditures for the first quarter. Just last week, the report showed that private business investments were up by 3.4% during the period, much better than the estimated 2.8% rise. Even though the RBA decided against hiking interest rates in their latest monetary policy statement, the central bank seemed unnerved by the impact of the floods. After all, RBA Governor Glenn Stevens did say that “domestic demand was likely to have grown solidly in the quarter.” Such an upbeat statement from the central bank head himself! Still, I’d take that forecast with a grain of salt since many are very pessimistic about the upcoming GDP figure. Could I be missing something? As I mentioned earlier, the recent numbers all seem to be pointing to a positive reading. Heck, with those better-than-expected consumer spending and investment figures, we might even see a stronger-than-expected GDP! 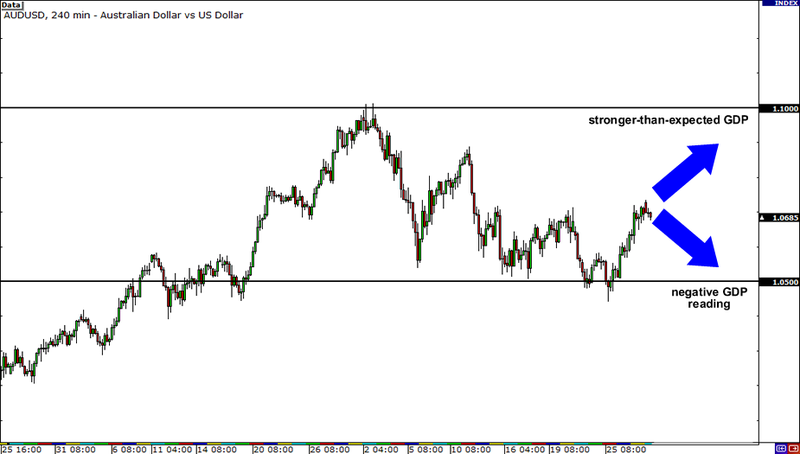 Either way, I’m keeping a close eye on the AUD/USD chart in order to trade the news. A stronger-than-expected GDP growth could push the pair back to its yearly highs around 1.1000 while a negative figure could trigger a break of the 1.0500 support. Which way do you think it will go? Share your thoughts by voting through our poll below!